The world's first weather satellite, TIROS-1, undergoes vibration testing at the Astro-Electronic Products Division of RCA in Princeton, New Jersey. Itfeels like second nature today to check tomorrow's weather on your computer oreven a mobile phone, but none of this would be possible without weathersatellites. 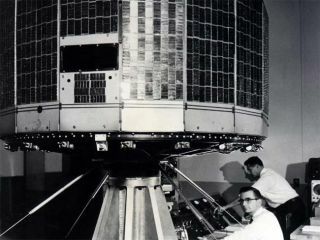 Theworld's first weathersatellite launched 50 years ago, on April 1, 1960. By capturing this highground, weather satellites changed a key way that humans view the future, makingit possible to foresee potential disasters before they arrive and prepare forthem. Now scientists are helping to prepare the next generation of weathersatellites. TIROS-1carried two cameras and two video recorders in a package 42 inches (about 1 meter)in diameter and 19 inches (48 cm) high, weighing 270 pounds (123 kg)altogether. The craft was made of aluminum alloy and stainless steel, and wascovered by 9,200 solar cells that helped charge its batteries. It couldmaneuver with the aid of three pairs of solid-propellant rockets. Thesatellite was polar-orbiting, meaning the path it tookbrought it over both the north and south poles of Earth. Such orbits are idealfor taking pictures of the entire globe. Atthe time TIROS-1was launched, the worth of satellite observations was still unproven. "TIROS-1started the satellite observations and interagency collaborations that producedvast improvements in weather forecasts, which have strengthened thenation," NASA Administrator Charles Bolden said. "It also laid thefoundation for our current global view of Earth that underlies all of climateresearch and the field of Earth system science." TIROS-1was NASA's first experimental step to see if satellites could find use instudying the Earth. Although it was operational for just 78 days, "thissatellite forever changed weatherforecasting," said Jane Lubchenco,undersecretary of commerce for oceans and atmosphere and National Oceanic andAtmospheric Administration (NOAA) administrator. "Since TIROS-1,meteorologists have far greater information about severe weather and can issuemore accurate forecasts and warnings that save lives and protectproperty." NASAlaunched 10 TIROS satellites in total, with each carrying increasingly advancedinstruments and technology. By 1965, meteorologists combined 450 TIROS imagesinto the first global view of the planet's weather, picking up a line of cloudsover the Pacific Ocean barreling toward the United States. In1975, NASA launched the first Geostationary Operational EnvironmentalSatellite, or GOES. Instead of a polar orbit, it had a geostationary one 22,300miles over the equator, allowing it to watch the same area constantly. Incombination with polar-orbiting satellites, these spacecraft gave weatherforecasters a powerful toolkit to monitor the planet. "Wecould not provide skillful hurricane forecasts without the crucial imagery anddata from geostationary and polar-orbiting satellites," said Chris Landsea, the science operations officer at NOAA's NationalHurricane Center in Miami. "Before satellites, tropicalstorms and hurricanes were often missed if they stayed out over the openocean. Now we know tropical storms and hurricanes have swings in numbers fromdecade to decade." Weathersatellites have proven key to helping saving livesduring disasters. For instance, when it came to the May 31, 1985Ohio-Pennsylvania tornado, near-real time satellite imagery helped the NationalSevere Storms Forecast Center in Kansas City provide a tornado watch warningfrom eastern Ohio into western parts of New York and Pennsylvania. "Thewatch prompted fire chief Clayton Reakes of NewtonFalls, Ohio, to take his customary position on the top of a building indowntown Newton Falls," said Steve Weiss, science operations officer atNOAA's Storm Prediction Center. "This permitted him to observe a largetornado approaching town and sound the alarm system before the F5 tornadostruck the town. Because of this series of early actions, starting withthe issuance of the tornado watch based on satellite indications of developingstorms, there were no fatalities in Newton Falls." Althoughthe tornado outbreak did claim 75 lives in the United States, it did occurduring the evening rush hour, "and this tragic event could have been muchworse," said Steven Goodman, senior scientist with the GeostationaryOperational Environmental Satellite-R series (GOES-R). Beyondjust keeping an eye on short-term changes in weather, technologicalimprovements gave scientists the ability to monitor long-term changes inclimate, from the subtle onset of drought and its impact on vegetation tomonitoring global sea-surface temperatures that signal atmospheric phenomenasuch as El Nino and La Nina. TheGOESand NOAA polar satellites also help keep an eye on space weather ?radiation from the sun that can wreak havoc on Earth and on satellites. Bymonitoring and forecasting space weather, researchers can know to postponesatellite launches, notify the astronauts on the International Space Station toseek shelter and shut down electronics to prevent damage, and help electricgrid operators on Earth take steps to avert failures. "NOAAChief Economist Rodney Weiher estimated that theeconomic benefits of providing reliable warnings of geomagnetic storms to theelectric power industry alone would be approximately $450 million over threeyears," said Bill Murtagh at the NOAA SpaceWeather Prediction Center. "Note that this doesn't include any otherimpacted industries, nor does it include the potential catastrophic impacts ofa widespread blackout due to a geomagnetic storm." NOAAand NASA are now working to launch the next generation of geostationary weathersatellites with the GOES-R series beginning in 2015. Its instruments will allowresearchers to observe cloud and surface changes more rapidly and in greaterdetail to help predict weather, as well as to map lightning flashes for earlywarnings of storm intensification and to monitor solar radiation for betterforecasting of space weather and early warnings of possible impacts to theEarth environment. TheU.S. program of polar-orbiting weather satellites recently underwent a shakeup.In February, the White House essentially dissolved the long-troubled NationalPolar-orbiting Operational Environmental Satellite System (NPOESS) that was to supposed to be the next-generation polar satellite systemfor monitoring the Earth. Instead,NOAA and NASA are scheduled to launch another polar-orbiting satellite calledthe NPOESS Preparatory Project in late 2011. This will demonstrate thecapabilities of next-generation sensors. NOAA and NASA will also team up to build,launch and operate two more polar satellites under the Joint Polar SatelliteSystem. The satellites, planned to launch in 2015 and 2017, should providevital information on climate and weather.